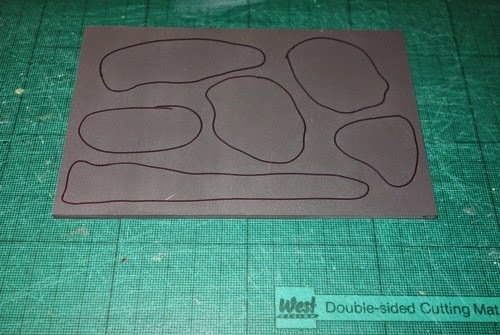 Needing something to visually break up the battlefield a little, I have started making some incidental terrain pieces. These are pieces that are of aesthetic value only, they never effect movement, give cover or block line of sight. As far as the game is concerned, they don't exist - they are just there to please the eye. To read the rest of this post please click the 'read more' link. On browsing internet posts and seeing magazine shots, I always enjoy those tables that make good use of both texture and terrain to reduce the bowling green / lawn effect. I am resigned to the fact that I am unlikely to achieve some of my favourite effects, such as sunken rivers and builings 'grafted' onto a board, because storage space is an issue and I need maximum flexibility with layouts for the minimum storage overhead. Other factors of budget, available spare time and modelling skills, might also determine what terrain systems we can manage at home. 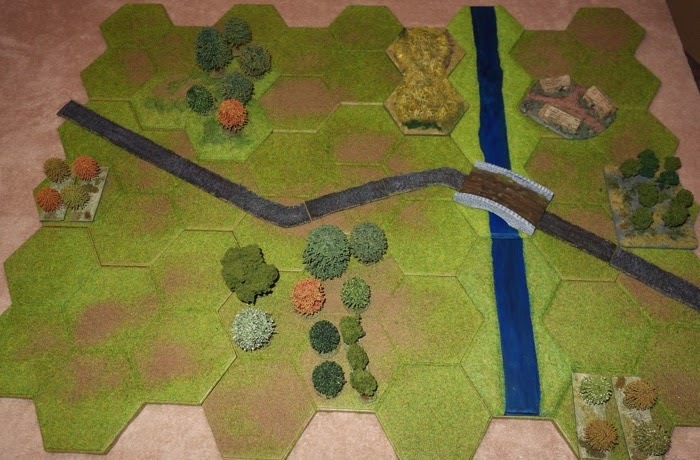 In my last post (Blow the Bridge), the hexed battlefield had enough terrain on it to do the scenario justice, but it still felt like it could do with more 'softening down' visually. I was recently looking at a table that had a scattering of rubberised lichen and tree foliage flock randomly placed over the table and that did help break things up. I am not a fan of the rubberised lichen for the small scales (i.e. my 10mm stuff), but the idea of scatter got me thinking. 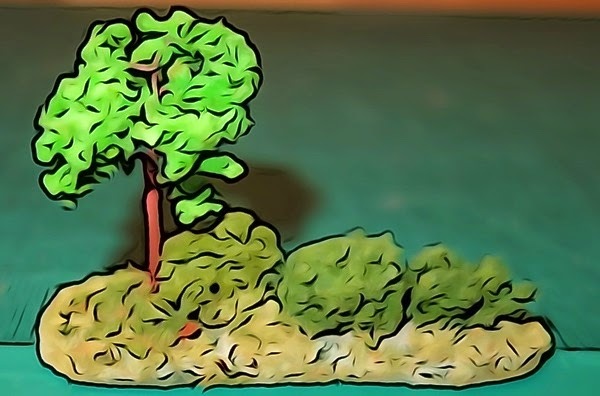 I decided to have a go at making some small terrain islands that would give a sort of scrub effect. They could be placed in open spaces, on some hex lines (to break up the grid effect) and up against other terrain to help soften their form. I should also get into the habit of adding a few single trees to otherwise open hexes (so they are not confused with woods or orchards etc), as lone trees on the table also help break it up. The whole point about these terrain bits is that they would be for visual purposes only. They would not effect the game in any way and could even be moved aside if they got in the way of play etc. 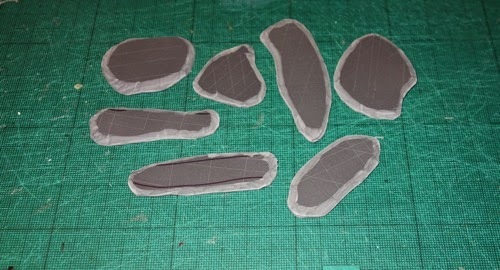 Anyway a trial of seven pieces was the initial project (the long shape on the bottom of the pad in the end became two pieces, giving 7 shapes - I think I should have left it as one piece, but was worried about warping). Materials used - The base had to be something that could be cut into irregular shapes and would be resistant to warp. My local art shop sells a sort of thick rubberised pad that is meant to be used in place of linoleum for artists that do line engravings for inking up and putting a negative image onto paper. At a £1 for a small 6 x 4 piece, it was worth exploring. It was difficult to cut and having safety with bladed tools, scissors or otherwise in mind, I think for the next batch I will explore something easier and thinner to use. A paste was made from basing paste (like wall filler), a drop of black acrylic paint, a larger drop of brown (burnt umber) acrylic paint and two generous pinches of my cheapest, most horrible flock to add texture. 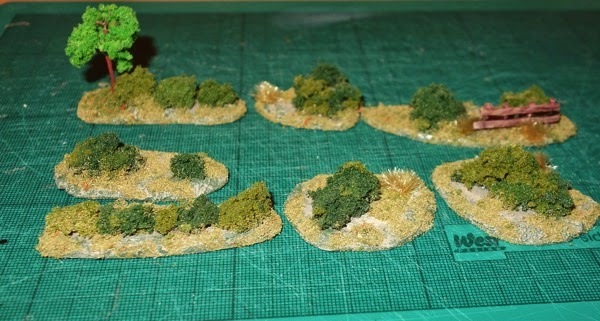 Green acrylic paint takes care of the edges and finally you need all the flocks, bushes, stones, dead tree trunks, trees etc that you would like to see grace your table and that are hopefully already in your bits and bobs box. Method - Scratch / score the surface of the base so that it provides a key for the paste to adhere to. Draw out the irregular shapes and cut them out. I used strong scissors, but may have degraded them in the process. The edges were then chamfered to get rid of the hard edge. The paste was applied to each base, not too thickly, but enough to cover everything. 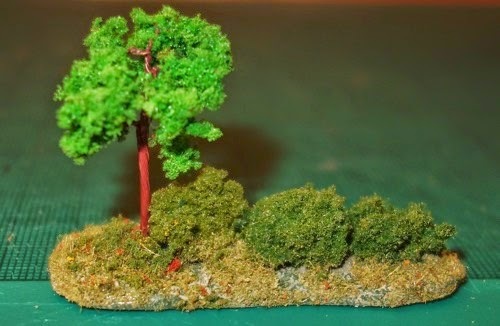 In those places that you think a tree will be placed, add some extra paste, so that the base becomes deep enough at that point to drill into and keep the tree upright (unless you are using plastic tree bases). Go around the edges and slightly onto the top of the bases with a green paint of choice that will best match the table. Once dry, dry brush it with a lighter shade, perhaps with some yellow in it. At this point I drilled the holes for a tree and some fencing, which were added with a hot glue gun. While the hot glue gun was out, I used it to attach the large pieces of clump foliage used to represent large bushes. Finally the remaining exposed areas had good PVA glue applied and were dressed with various flocks. A few spaces were kept free to dry brush as open ground. Once complete and dry everything can be locked down with a blast of varnish, fixative or even hairspray. The new pieces look nice on the table, though a few more need to be knocked up, with maybe a better variety in size. Already I am thinking of other features, perhaps a small pond with reeds or maybe a couple of vehicle wrecks or an abandoned cart or ruined shed or even some cows might look fun. Other than the cost of £1 for the base, I had everything else to hand for the initial seven bases, so it has not been a costly experiment. Nice stuff...have you considered vinyl floor tiles for basing - stick side up for obvious reasons. They are thin and don't warp. I've had single layers of peel-n-stick vinyl floor tiles warp, over time. I now stick two tiles together (peen and stick), then paint, texture, and seal with a clear coat. They cut easily with a utility scissors (easy free-form cutting), or a razor knife with a steel ruler (more effort, but also more accurate when straight cuts are needed). Cheers! Thanks, yes that sounds like a better material, even if doubled up, it would give a thinner base, which I think would look better. This is a clever idea! I'm very bad at just fighting on open fields with no 'garnish' (legacy of a lot of HOTT and DBA I think). Years ago, though, we used to use clutter in Fire and Fury games in the form of fence-lines and fields, which had no effect on the action (it being a brigade level game) but made the field look busy. After a while, though, we realised that some people were still instinctively lining up their troop behind the fences; the garnish was affecting how the battle developed.